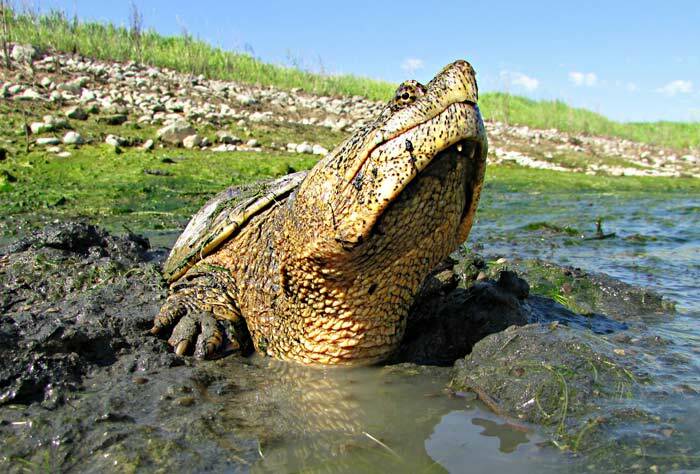 Snapping turtles are omnivores and eat aquatic plants, frogs, fish, insects, birds, worms, crayfish, spiders, snakes, carrion and small mammals. Older turtles will ambush and attack their prey while younger turtles are more likely to forage for food. Snapping turtles reside in aquatic habitats, including swamps, bogs, creeks, streams, lakes, marshes, rivers and pools, so they eat a lot of algae and leaves, which compose about one-third of their diets. They prefer habitats that feature sandy or muddy bottoms, as well as slow-moving water. To attack their prey, older snapping turtles will sit and wait in the water and quickly lunge their head forward to seize the prey with their jaws.